Check out Tobi's Oh So Sweet Bodycon Dress Date night mode: ON. Impressing is easy with the Oh So Sweet Black Bodycon Dress. This cocktail dress features a lace overlay with a halter neckline, open back, and cord strapping detail in the back. The short lace dress will look fab with ankle strap heels. Date night mode: ON. Impressing is easy with the Oh So Sweet Rose Bodycon Dress. This cocktail dress features a lace overlay with a halter neckline, open back, and cord strapping detail in the back. The short lace dress will look fab with ankle strap heels. Date night mode: ON. Impressing is easy with the Oh So Sweet Black Bodycon Dress. 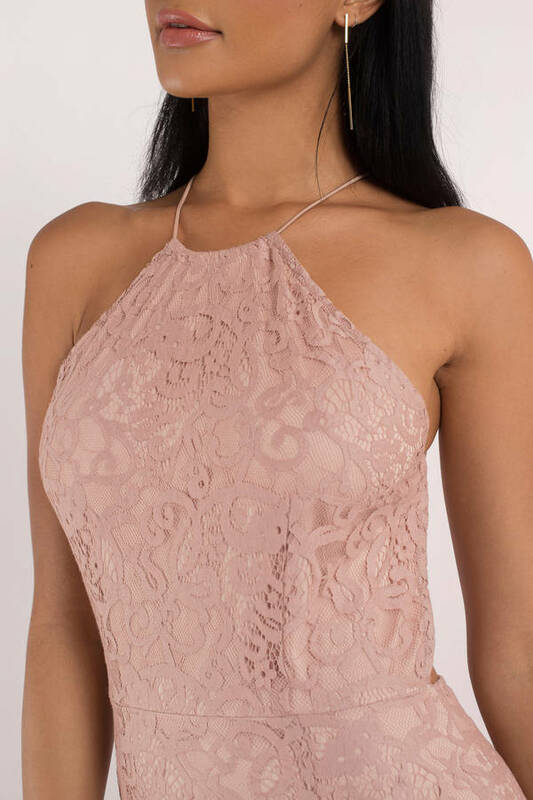 This cocktail dress features a lace overlay with a halter neckline, open back, and cord strapping detail in the back. The short lace dress will look fab with ankle strap heels. Date night mode: ON. Impressing is easy with the Oh So Sweet Burgundy Bodycon Dress. This cocktail dress features a lace overlay with a halter neckline, open back, and cord strapping detail in the back. The short lace dress will look fab with ankle strap heels.